Depending on how you look at it, Russian-made .30-06 ammo is either blasphemy or a great way to save money on this notoriously expensive cartridge. 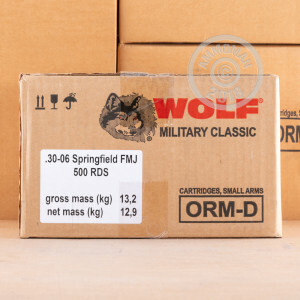 If you're of the latter mindset, pick up a 500-round case of Wolf ammo. These rounds use a 145 grain bimetal jacketed bullet and achieve a muzzle velocity of 2,781 feet per second. Unlike some surplus .30-06 ammo, these rounds use non-corrosive Berdan primers. 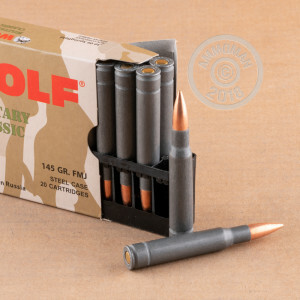 The steel cases are polymer coated for smooth feeding and ejection; although not reloadable, they decrease the cost of this ammo considerably. Although superseded in military use by the 7.62x51 and 5.56x45 NATO cartridges, the .30-06 Springfield remains a popular cartridge, both for shooters of vintage military rifles such as the M1 Garand and M1903 and for hunters and long range target shooters who value the round's excellent long-range ballistic properties. Pick up this case of 500 rounds or any other items totaling over $99 to receive free shipping from AmmoMan.com. Cycled great in the M1, nice accuracy.